So last night I held another serious private playtest. This time with 4 players. The results left me with several fixes to do of course, but most importantly: none of them scary. The desired gameplay emerged for large time periods (maybe up to 40 mins) but was not yet dominant. At several points I was being coerced to basically give points (uranium) to an opponent, until I could find a time to toss my collar and get away. Hopefully this means I can slow down adding features and begin to shift my energies towards balancing. I am most happy with the changes caused by the addition of the ‘collar’ item. 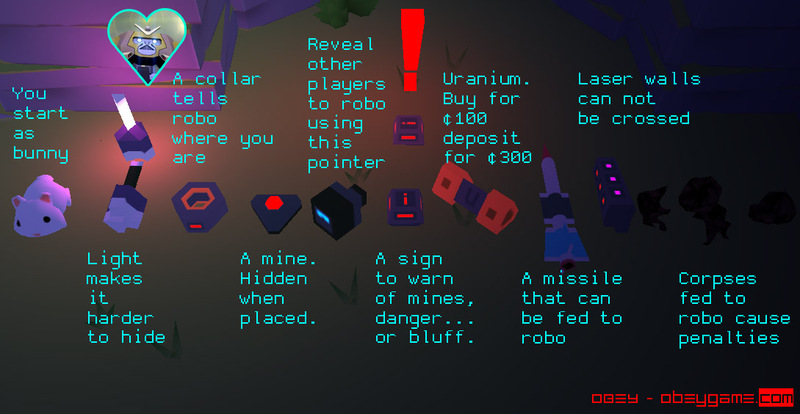 All collars in the map can be easily seen by robo. 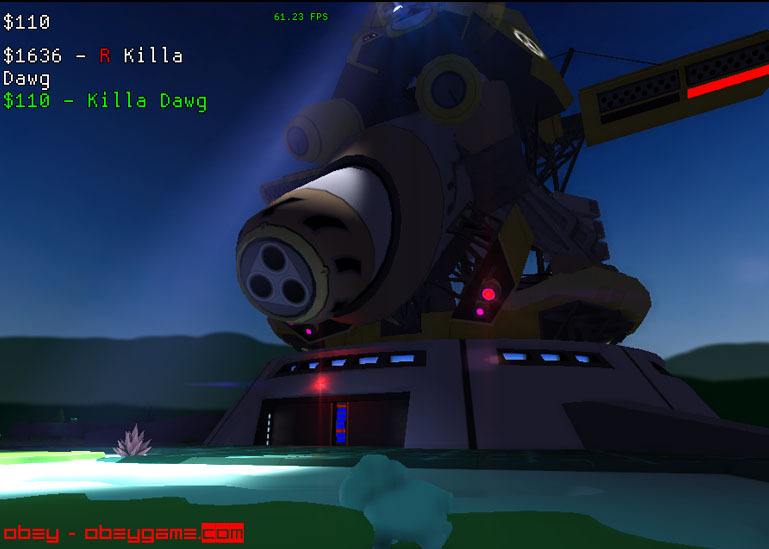 Having the collars really changed the dynamic of the game and pushed it into coercion territory. 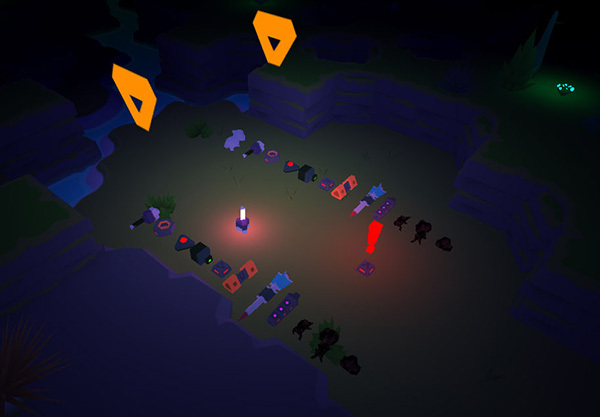 Players in robo consistently used them as designed, ordering “put them on or die” to make subjects trackable and hence submissive. Yet, allowing bunnies to drop the collar like any other item left just enough ‘out’ to allow bunny players to find narrow opportunities to escape (and I was able to do this myself multiple times). The pointer unfortunately was not used much. I think I have to make it more practical and beneficial to use. It could be because of the map though: the test map had an outcrop between robo and the drop area so it was hard to point out players that were near robo from where most of the pointers were. The sentries flip on as soon as robo changes hands to fry any players that might have been tailing the new robo player or camping robo’s door. The sentries were supposed to cause players to think twice before going straight for robo’s door if they saw another bunny vying to get in at the same time (ie if they weren’t sure they could make it first, they would have to make a decision whether to wait it out or risk almost certain death). In the playtest however, it almost always just caused a game of chicken where both players just rushed for robo anyway, with the second player getting fried. It worked well though, and I don’t think I will change it since it gives new robo players 30 seconds (while the sentries are active) to consolidate their situation before competition for robo begins again. Want to be part of it? Drop by the booth with your friends!